GM's updating all its big crossovers for the 2013 model year: look for a refreshed GMC Acadia and Buick Enclave if you're shopping seven-seaters exclusively from General Motors' brands. The 2013 Chevrolet Traverse hits a sweet spot for SUV replacers, with none of the flamboyance of a real SUV and more practical gas mileage and interior space. The 2013 Chevrolet Traverse is a crossover built to replace the minivan in your driveway, and while it may be somewhat lacking the charisma department, charm is hardly the point of this big, mainstream family hauler. It's focused on delivering three rows of seating without the compromises in gas mileage and existential angst that come with SUVs and minivans. On those terms, the Traverse makes good sense. GM says the 2013 Chevrolet Traverse has "an athletic new exterior design," but it's not much more than a mild refresh of last year's model, touched up with new front- and rear-end styling, Up front, the Traverse features Chevrolet's new face for crossovers, but in back the Camaro-influenced taillamps are more memorable. The Traverse's interior design has been a bit drab, in a class of vehicles that all seem to aim to provide a bit more flair than minivans. There's no radical change here for 2013; but new wood trims and silver accents, contrast stitching, and ambient lighting do help to lift the ambiance. The Chevrolet Traverse performs in a way that's quick enough for family use, but not at all sporty. 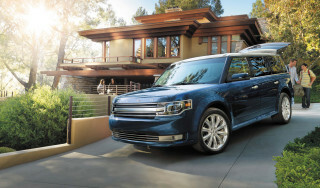 Don't expect quickness or agility, as this is a vehicle that doesn't do much from behind the wheel to mask its roughly 5,000 pounds. 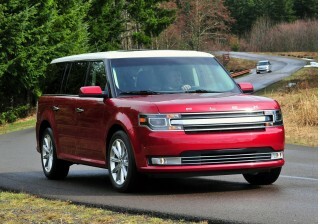 Power remains provided by a smooth 3.6-liter direct-injection V-6 rated at 288 horsepower and 270 pound-feet. In the past we've found the six-speed automatic transmission to be lumpy on light acceleration, and slow to downshift when the pedal's to the metal; but for 2013 it features new programming which Chevrolet says results in more confident highway passing power with quicker shifts. Both front- and all-wheel-drive configurations are available, but we've noticed that AWD versions do sap a little more power from the experience; as such, the Traverse feels quick enough for its intended family-hauling purpose. Ride and handling have been improved with new rebound springs in the front which helps with roll control. 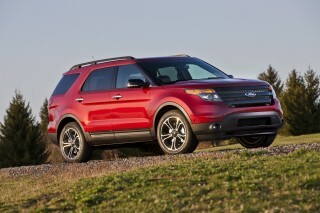 The Traverse will be able to tow up to 5,200 pounds. If you shy away from minivans, the Chevy Traverse remains one of the roomiest, most comfortable, and most passenger-friendly vehicles you can get. GM has made the most of the seating space in the Traverse, and it's clear the primary purpose is people-moving. Over three rows, there's space for up to eight occupants, with the seats divided into two front buckets and two 60/40-split benches. For the second-row, bench or captain's chairs arrangements are offered, and we'd opt for the bench as the individual seats aren't much more comfortable, yet you sacrifice a seating space. Folding the second and third rows down yields 117.5 cubic feet. As one last jab from the minivan side, the cargo floor in the Traverse does seem a bit high and in turn you don't have quite as much cargo space for large items. From a functionality standpoint, GM has redesigned and reconfigured the Traverse's climate controls for 2013; they're more straightforward and easier to use; that, combined with more soft-touch materials for the instrument panel and door uppers, as well as new silver-accent details, altogether gives the Traverse a more upscale feel inside. A new 6.5-inch touchscreen infotainment system is standard, and Chevrolet's new MyLink system is available. The MyLink system is an interface for using Bluetooth streaming with smartphones, as well as Internet radio apps such as Pandora and Stitcher. Climate controls are now easier to use, as they are larger and illuminated at night. The Traverse, together with the closely related Buick Enclave and GMC Acadia, is one of the first vehicles on the market to offer a front center side airbag. Built into the driver's seat, the airbag system helps protect the driver (or the driver and front passenger) from certain types of side impacts. 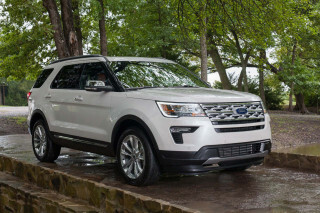 Otherwise, standard safety features include parking sensors, a rearview camera system, hill start assist (to help you start safety on a steep incline), and head-curtain side bags with rollover mitigation technology. And on LTZ models, the Traverse includes Side Blind Zone Alert and Rear Cross Traffic Alert—both features that provide alerts to the driver and may help avoid collisions. The Traverse earns some of the best crash-test scores of any vehicle sold in the U.S. The 2013 Chevrolet Traverse is available in three trim levels—LS, LT, and LTZ—with each of them offered in front- or all-wheel-drive configurations. LTZ models approach luxury-level, while LS trims are no-fuss (albeit well-equipped) family vehicles. New to the lineup for 2013 is the Chevrolet MyLink system, which includes a 6.5-inch color touch screen, enabling smartphone integration as well as easy streaming of Pandora and Stitcher internet-based entertainment (with your smartphone's data plan). The Traverse gets a more attractive front end and interior this year. First things first: GM touts the 2013 Chevrolet Traverse as having "an athletic new exterior design," but by design it's essentially a mild refresh of last year's Traverse—with new front- and rear-end styling, Up front, the 2013 Traverse features Chevrolet's new face for crossovers. 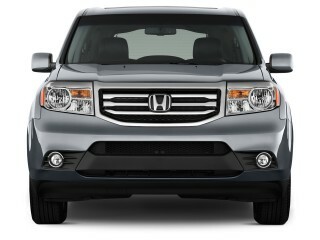 The grille design has been updated with a three-bar upper and two-bar lower design. Darkened headlights and a more sculpted hood round out the updated front end. The net effect of these front-end changes is that it, oddly, feels a bit blander compared to the outgoing edition. In back, Chevy started with what was already an utterly forgettable design, and it's gotten better thanks to some new details—mainly in the name of headlamps that bear a resemblance to the Camaro muscle car, but also in some new sculpting, a somewhat different hatch design, and a license plate that's been moved up from the bumper and integrated into the tailgate. Throughout the Traverse there's some additional chrome trim and brightwork. The Traverse's interior design has been a bit drab, in a class of vehicles that all seem to aim to provide a bit more flair than minivans. The cockpit design is still very simple, with a layout that's pretty much a halfway point between what Chevy uses in its full-size SUVs like the Tahoe and what's in its mainstream sedans like the Malibu. The materials have been updated with soft-touch surfaces for the instrument panel and the upper door trims. Chrome and silver accents, combined with contrasting stitching, add to the new details. At night, blue ambient lighting glows throughout the cabin. Compared to its cousins, the GMC Acadia and Buick Enclave, the Traverse has neither the edgier design flair of the GMC nor the retro-curvy hints of the Buick Enclave. Identical drivetrains should provide the same performance as before. 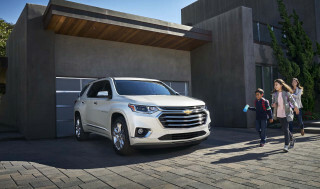 The Chevrolet Traverse performs in a way that's quick enough for family use, but not at all sporty. Don't expect quickness or agility, as this is a vehicle that doesn't do much from behind the wheel to mask its roughly 5,000 pounds. 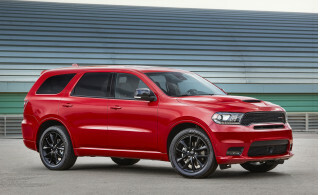 Power remains provided by a smooth 3.6-liter direct-injection V-6 rated at 288 horsepower and 270 pound-feet. In the past we've found the six-speed automatic transmission to be lumpy on light acceleration, and slow to downshift when the pedal's to the metal; but for 2013 it features new programming which Chevrolet says results in more confident highway passing power with quicker shifts. The Traverse has pretty well-tuned, old-style hydraulic power steering, and for 2013 Chevrolet has made some changes—rebound springs and low-velocity shock valving—to firm up the Traverse's response to quick handling manuevers, yet keep its ride smooth. While we haven't yet put the Traverse through the paces in this respect, it likely won't make major advances from its previously ponderous manners. Expect ride quality to be a bit better, in any case. We're looking forward to seeing the upgraded cabin's fit and finish. If you shy away from minivans, the 2013 Chevrolet Traverse remains one of the roomiest, most comfortable, and most passenger-friendly vehicles you can get. GM has made the most of the seating space in the Traverse, and it's clear the primary purpose is people-moving. Over three rows, there's space for up to eight occupants, with the seats divided into two front buckets and two 60/40-split benches. The Traverse's front seats are plush yet supportive—as good as those in any other large crossovers or SUVs (now with a power passenger seat and adjustable front headrests)—and the adult-sized second row slides forward to provide access to the surprisingly comfortable (for kids) third-row seats. However, it does take a high step up to enter that back row. Second-row captain's chairs are also available, but they're really not any more comfortable than the bench perches and carrying capacity is then reduced to seven. In all, you might end up wishing for sliding side doors; it's not easy to clamber in there even with the friendly seating arrangement. With 24.4 cubic-feet of cargo space behind the third row, and 12 cup holders, the Traverse is without a doubt a true family hauler. But the Traverse's long rear doors do have some disadvantages next to sliding doors, as they tend to make entry and exit (or loading of children into booster seats) challenging if you're in a parking lot with tight spaces—or in your own garage. Folding the second and third rows down yields 117.5 cubic feet. As one last jab from the minivan side, the cargo floor in the Traverse does seem a bit high and in turn you don't have quite as much cargo space for large items. Chevrolet has given the cabin some modest upgrades; three interior colors will be available including Ebony and Mojave, Light Titanium and Dark Titanium, and Ebony, and new wood trim is standard on LT and LTZ models. The Traverse already had a tight, quiet cabin with excellent noise suppression and a remarkably smooth ride—plus solid, high-quality switchgear, an intuitive control layout, and clear displays. We expect all this to carry over to the 2013 model; but with suspension improvements the Traverse should keep road noise better at bay. 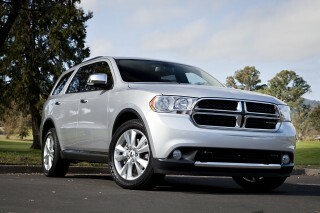 The Traverse earns top safety scores--before the new front-center airbag's even been tested. 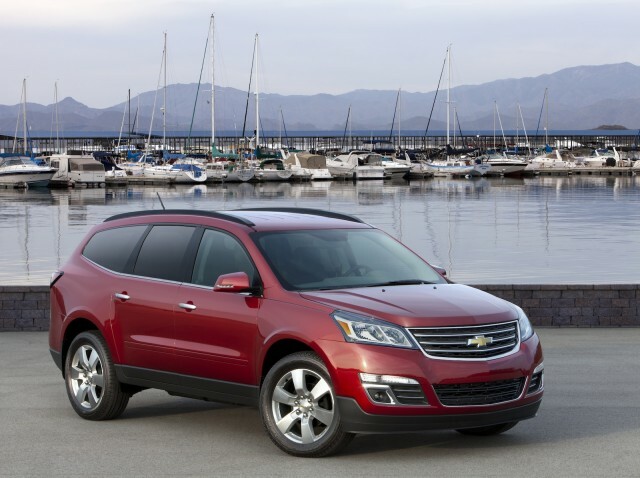 The 2013 Chevrolet Traverse carries on this model's reputation as one of the safest vehicles you can get. In previous model years, the Traverse has earned nearly perfect crash-test ratings in all categories. Together with the closely related Buick Enclave and GMC Acadia, the Traverse is one of the first vehicles on the market to offer a front center side airbag. Built into the driver's seat, the airbag system helps protect the driver (or the driver and front passenger) from certain types of side impacts. The Traverse includes standard parking sensors, a rearview camera system, hill start assist (to help you start safety on a steep incline), and head-curtain side bags with rollover mitigation technology. That's all in addition to the expected full roster of airbags, anti-lock brakes, and stability control. On LTZ models (and optional elsewhere) the Traverse includes Side Blind Zone Alert and Rear Cross Traffic Alert—bpth features that provide alerts to the driver and may help avoid collisions. Outward visibility hasn't been great as we've tested it in Traverse models—but all the camera system does help. OnStar is also included in all Traverse models; it includes six months of Directions and Connections service, with Turn-by-Turn Navigation sent to the car by an operator, with no need to stop and input addresses. OnStar still includes Stolen Vehicle Assistance and an OnStar Mobile App for remote control of locking, engine starting, and remote viewing of vehicle information. New infotainment features don't quite match the advanced features in some competitors. 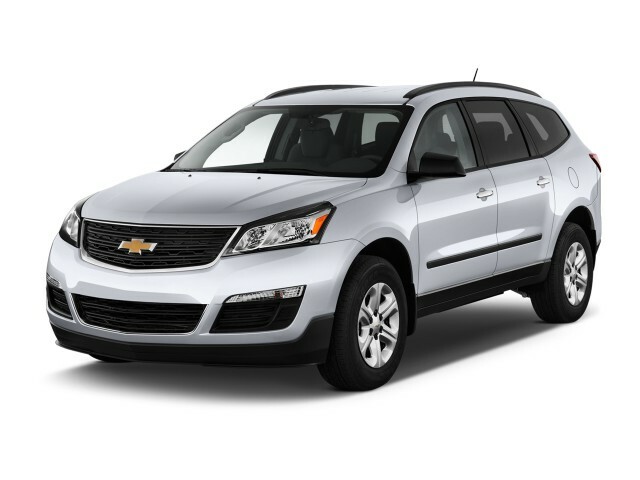 The 2013 Chevrolet Traverse is available in three trim levels—LS, LT, and LTZ—with each of them offered in front- or all-wheel-drive configurations. LTZ models approach luxury-level, while LS trims are no-fuss (albeit well-equipped) family vehicles. Base Traverse LS models come with keyless entry; a tilt/telescopic wheel; power windows, locks and mirrors; cruise control; Bluetooth; and an AM/FM/XM/CD sound system. The standard OnStar system includes Turn-by-Turn navigation and points-of-interest information. New to the lineup for 2013 is the Chevrolet MyLink system, which includes a 6.5-inch color touch screen, enabling smartphone integration as well as easy streaming of Pandora and Stitcher internet-based entertainment (with your smartphone's data plan). Major options include the rearview camera; a power liftgate; heated and cooled front seats; and a DVD entertainment system. The top-spec LTZ can be equipped with a rear spoiler; dual exhausts; and a panoramic sunroof. 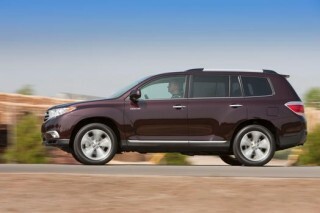 No gas-mileage improvements are expected in the updated Traverse. The Chevrolet Traverse has a six-speed automatic transmission that's been recalibrated for 2013. 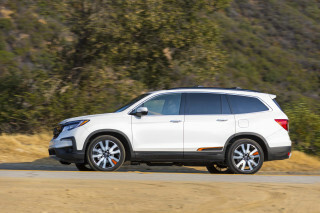 While that might make it smoother or more responsive, it doesn't make it any more fuel-efficient; the Traverse keeps its ratings—of 17 mpg city, 24 highway with front-wheel drive, or 16/23 with all-wheel drive—that are neither a standout for fuel-efficiency nor in gas-guzzler territory. We should note, though, that in many previous drives of the Travers and its Buick Enclave and GMC Acadia siblings, we've failed to see real-world mileage in the vicinity of those EPA ratings.